Studies of molecular hydrogen at static or sustained multimegabar pressures are difficult as a result of challenges in containing the samples under these conditions, and making accurate measurements of the material sample in the diamond anvil cell. Nevertheless, recent advances in diamond anvil cell techniques have now enabled measurements on hydrogen to above 300 GPa at room temperature, and new findings are providing additional evidence for the complexity of this enigmatic element. 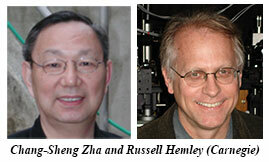 In recent work at Carnegie, Raman measurements of hydrogen and deuterium have been carried out to new regimes of pressure and temperature - to 325 GPa at 300 K. CDAC Research Scientist Chang-sheng Zha and CDAC Director Russell Hemley, together with Carnegie's Ronald E. Cohen and Ho-kwang Mao, conducted the research. The measurements provide structural information on hydrogen with increasing density along the I-III-IV transition pathway. 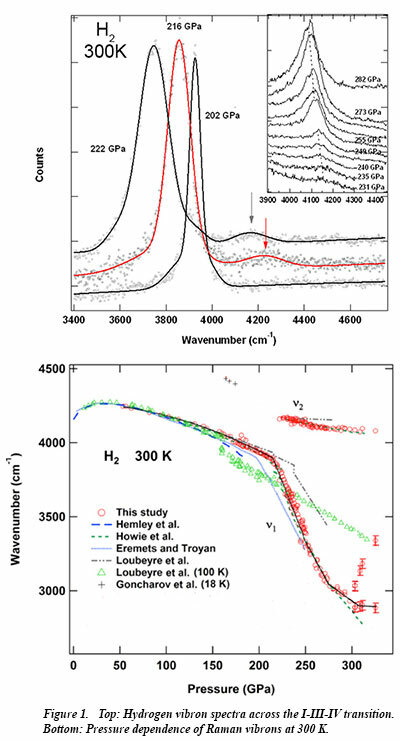 A detailed analysis of the spectra indicate that transitions in hydrogen proceed by the formation of a sequence of disordered stackings of molecular and distorted layers. Changes in intensities and linewidths of the hydrogen vibron with increasing pressure are accompanied by discontinuities in pressure shifts, which indicate changes in structure and bonding, molecular orientation and electronic structure in the compressed solid. The results further point to the formation of new phases, which may be either completely new structures, or variations of the structure of phase IV. Although it would appear to be the simplest element in the periodic table, hydrogen continues to reveal surprising behavior that differs from that expected from long held views. Further work will seek to not only clarify known regions of the phase diagram and explore new pressure-temperature regimes, but also to improve existing theoretical models [C. S. Zha et al., Proc. Nat. Acad. Sci. 111, 4792 (2014)].